Light in weight and at first sight unremarkable, the Kicker is in fact a calibrated tool that offers an instant EQ fix for your bass drum. It's cheap, effective and highly recommended. Maintains the finest elements of a drum's natural tone. Excellent value for money. The Kicker is the brainchild of Manuel Markovic, drummer, sound engineer and owner of Sonitus Acoustics. In essence, a shaped muffler that runs the entire length of the bass drum, Sonitus claims that it gives dramatic results with even the cheapest single-ply heads and can also be used with both ported and unported front heads. 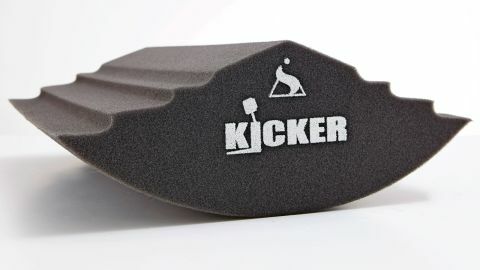 Manuel initially designed the Kicker for his own personal use but it generated so much interest he put it into production. "The drum still sounds warm, deep and resonant and not really dampened a great deal at all"
Its creation was a eureka moment for Manuel. Despite trying over 20 different variations, he found it impossible to improve on his first prototype; it is this model that is now being marketed. Sonitus already produces a variety of acoustic foam sound absorbers for studio use and the Kicker is a logical extension of this frequency-sculpting art. Made from rigid polyester foam, it takes the form of a cylinder-long segment detailed with graduated steps running down from a central peak. The shaping and density of the foam is intended to absorb unwanted frequencies, allowing the desired ones to come to the fore while also controlling the decay. You'd expect - not unreasonably - that inserting a chunk of foam into a bass drum that touches both heads would have a profound effect on its sound; we're actually struck by how subtle the difference is. Knowing what an equivalent sized pillow placed head to head would do we're anticipating an extremely dry and dampened response. Instead, the drum still sounds warm, deep and resonant and not really dampened a great deal at all. There's a definite focus to it along with a pronounced bottom end, but nothing feels forced; it's as though a sound engineer has run the kick's signal through the mixing desk and tweaked a few pots in order to accentuate its natural qualities. The fact that the Kicker - by design - only just kisses both heads rather than buries itself into them almost certainly explains the relative openness of the sound (and also why the Kicker comes in so many different lengths). Whatever the reason, it works.